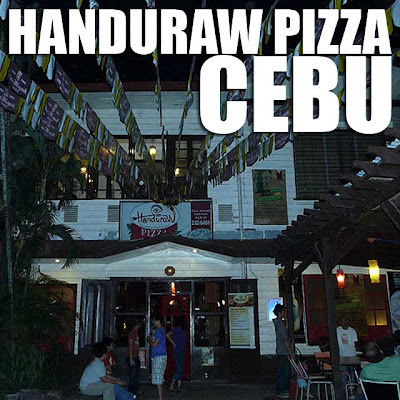 Cebu: Handuraw Pizza, the best tasting thin crust in Cebu! Those who've been reading my blog should have noticed pizza is one of my favorite foods. So while in Cebu, I made sure to try out some of the pizza favorites. And among the top choices is Handuraw Pizza! Handuraw Pizza serves 12-inch pizzas on a really thin crunchy crust which I really liked. 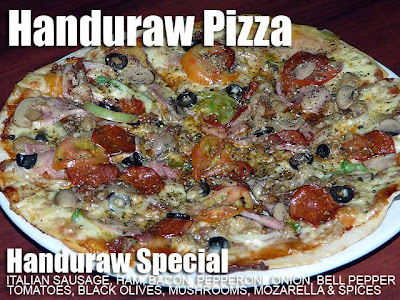 The best seller is the Handuraw Special (Php298) which has almost everything on it including Italian sausage, ham, bacon, pepperoni, onions, green bell pepper, tomatoes, black olives, mushrooms and spices. Another best seller is Pizza Cebuana (Php298) which is chorizo de Cebu and kesong puti. Also try out Filipino Anchovy (Php288) which has dilis or ginamos (Philippine anchovy) and pesto sauce. Last on my picks would be the American Roast (Php288) which has roast beef, honey mustard, fresh lettuce, mushrooms and onions. Every Sunday, they have a pizza, pasta and pica-pica buffet from 11 a.m. to 2 p.m. and 6 to 10 p.m. At Php238 per person, how could you go wrong?! Plus the restaurant is a fine example of adaptive reuse of old architecture since it is situated in an old house which of course adds to the ambiance of the place. And the good news is they have a branch in Metro Manila. It's hidden in an Internet cafe in Katipunan. Well at least now it's no longer a secret! The thinner the better Ivan. Will have to stop by on our next visit to Cebu! They have recently opened a branch of Handuraw in Davao City! Great pizza!